Mozilla's Open Badges make it easy for anyone to issue, earn and display badges across the web through a shared infrastructure that's free and open to all. 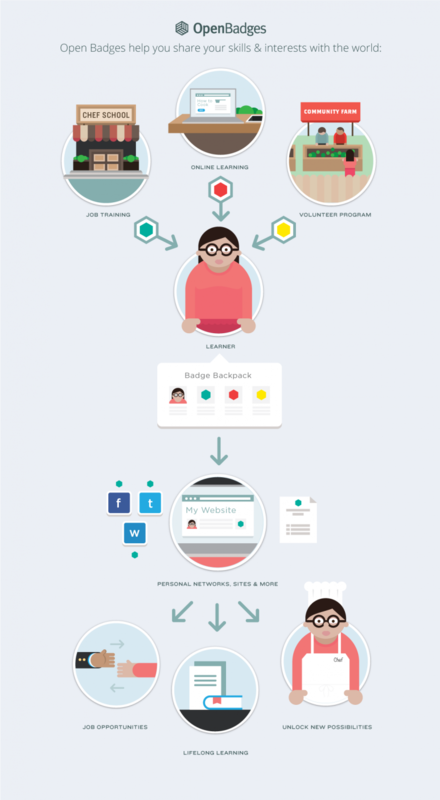 A digital badge is an online representation of a skill you’ve earned. Open Badges take that concept one step further, and allows you to verify your skills, interests and achievements through credible organizations and attaches that information to the badge image file, hard-coding the metadata for future access and review. Because the system is based on an open standard, earners can combine multiple badges from different issuers to tell the complete story of their achievements — both online and off. Badges can be displayed wherever earners want them on the web, and share them for employment, education or lifelong learning. Mozilla BadgeKit is a set of foundational tools to make the badging process easy. Supports key stages in the badging experience including creating, designing, assessing and issuing. Includes remixable templates and milestone badges allowing for easy customization. Provides modular and open options (standards) for the community of badge makers to use and build upon within their existing sites or systems. The hosted version of BadgeKit is currently only available for select organizations as part of the Cities of Learning initiative - sign-up for private beta has now ended. Alternatively, anyone can download the code from GitHub and implement it on their own servers. A tutorial for this process is available here. Check out the Boys and Girls Clubs of Canada Badge Centre and earn your first badges! Read more about the Technology behind Open Badges. Find the Onboarding information for Issuers, Displayers and Earners and get started! Open Badges learning group and development group -- Subscribe to these groups to take part in ongoing conversations about badges in the wild. Open Badges Community Calls -- Join our weekly global call every Wednesday at 9am PT / 12pm ET / 5pm GMT. During these hour-long calls we share our progress and encourage you to share your Open Badges work, questions, and comments. They're fun and we encourage you to come along! Open Badges Research & Design Calls -- If you are interested in Open Badges Research and Badge System Design, join this call, held on Wednesdays in the hour before the Community Calls, at 8am PT / 11am ET / 4pm GMT. Open Badges Blog -- Follow our blog for Open Badges news and updates. Twitter -- Follow @OpenBadges and use the #OpenBadges hashtag to join the conversation on Twitter. Facebook -- Like us on Facebook for news and updates you can share with your networks. Open Badges presentation materials -- Want to give an Open Badges presentation? To get you started, here's a PDF. Please note that all of these documents are CC by SA. Common badges terms and vocabulary -- Help us to build a common lexicon of digital badge terms. User stories -- Hypothetical examples of how badges can help solve problems in everyday scenarios. 2 Million Better Futures -- This project from CGI America aims to help 1 million workers and 1 million students succeed using Open Badges by 2016. Chicago Summer of Learning -- The first citywide badging initiative, which was so successful that Mayor Emmanuel committed to continuing the program next year. Participating Issuers -- An updated list of badge issuers and designers. General Badge Issuing Platform Chart -- A list of platforms for issuing open badges generated and continuously updated by the community. Add your organization! -- If you're issuing, designing or exploring open badges with your communities, add your organization to our list of issuers. Case Studies -- A set of case studies looking at how badges are being used to capture learning and achievements in higher education, professional training, and after school programs. Open Badges roadmap -- We're continually updating the roadmap with new features. Digital Media and Learning Competition: Badges for LifeLong Learning (administered by HASTAC and funded by MacArthur) -- click to learn more. Join Mozilla -- you could get a snazzy t-shirt for joining! Mozilla's mission -- Read more about our mission to promote openness, innovation & opportunity on the Web. Get updates from Mozilla -- Be the first to know what we're doing and how you can get involved. This page was last modified on 11 May 2017, at 03:16.